After my 30 minute power walk, I hopped right into the Circuit A Exercises in the Bikini Bootcamp book. Tomorrow I’ll post the Circuit and Core workouts for you to see. Whew ~ it felt great to check off the two tough workouts this morning. I am saving journalling, meditation and yoga for tonight before bed. I sipped on a cup of Morning Burst this morning while I got ready and couldn’t wait to dive into my breakfast. 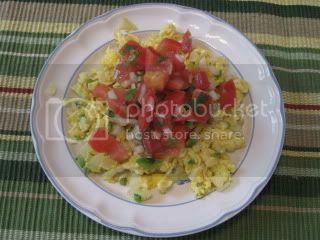 Do you all have any idea how excited I was to see I get to have eggs with salsa?! Today’s breakfast was amazing! The book said to just top it with tomatoes and cilantro, but, why do that when you have a fabulous homemade salsa in the fridge. This absolutely hit the spot! Just look at how good it looks ~ Yup it tasted that good too! I took a big cup of my Morning Burst to work with me today but you know I am missing my decaf coffee. I am allowing myself one cup today in place of some herbal tea….I miss the FLAVOR of coffee! * FREE samples of Jack Daniels BBQ sauce & Lea Perrins Steak Sauce – click HERE. * Do you have a Border’s near you? Click HERE for a 25% coupon on any item though 06/07/09. * You all know I LOVE Hungry-Girl – She STILL has me thinking about her recipe on Tuesday for Rocky Road….Click HERE to check it out. * Join us in Bikini Bootcamp this month and you could win a FREE copy of the book. Click HERE. * Check out my Crunchtastic Mr. Krispers Giveaway by clicking HERE. Today is another busy, but, fun day. If I was really at Amansala in Mexico, I KNOW I’d be getting a pedicure. Since I have missed out on my spa treats this week (no worries, I’ll be doing them this weekend for sure), I am heading out to get a pedicure at lunch ~ Can’t wait! « Mr. Krispers Giveaway ~ the 2 WWP Snappy Chips!! Ahhh salsa! It's so universal – those eggs look delicious! I love walking at an incline. Feel the burn!!! Beautiful eggs! Wait until you see mine tonight…I always mess scrambled eggs up! Haha. Love that you got the big workouts done already. I was doing my circuit last night until after 10pm. Not a great decision!! love the mexican inspired meal, senorita ;)! What is Morning burst? I'm curious! Thanks so much for the words of encouragement 🙂 It's comforting to know there are others supporting and rooting me on. Btw, the quote on the top was my own, glad you liked it! Hey guess what??? I'll be in CALI tomorrow! Woo hoo! 5AM!?!?! WOW! Can't believe you are up so early. I recently have started getting up earlier to get my workouts in – I am so loving getting it done first thing. I start my day out right and I don't have to worry about anything coming up that might force me to cancel out. If I do it first thing then nothing gets in the way. five in the morning girl?! you are dedicated! 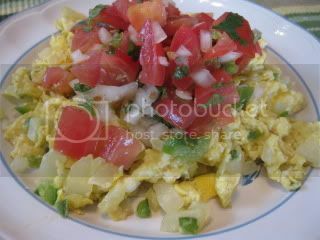 salsa and eggs has got to be one of the best combos around! and your fresh homemade salsa looks soo yum. i adore how you make everything from scratch.. no bottled nonsense for danica! oh.. i have a box waiting for me at home! 😀 im counting down the hours!!! K ~ I agree – I think I could put salsa on just about anything! Meganerd ~ OMG – my legs and buns were burning for sure! Angelea ~ Ohhh, I can't wait to see your eggs now. I was thinking you had sheer dedication to stay up so late to get in the circuits and core – WTG! Good luck tonight – walking in the rain can be fun. Jenny ~ It was awesome! 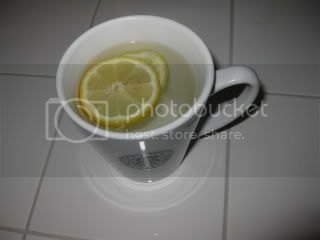 Jess ~ Morning burst is simply hot water with lemon. The bikini bootcamp book says it is the first thing you should drink in the morning to cleanse/detox your body. Glad I can help give you support too – anytime, i am always here. yeah for being in Cali – how long? Trish ~ I couldn't agree more – If I do it first thing before my brain can think, I don't end up talking myself out of it at all. Great job at getting started doing morning workouts! Julie ~ Yup – it is for the way I feel AFTER I work that keeps me getting up that early. Only a week… this fri-next fri! I leave after work, hoodie hoo! Jess ~ I just saw that on your blog this morning – Yeah!!! You are going to have such a great time! San Diego Rocks!